Since 1979, the U.S. has maintained unofficial relations with Taiwan to preserve the U.S.’s recognition of the People’s Republic of China (PRC) and in support of the one-China policy. However, tensions have frequently flared up between Beijing and Taiwan over issues of international recognition and independence for Taiwan. 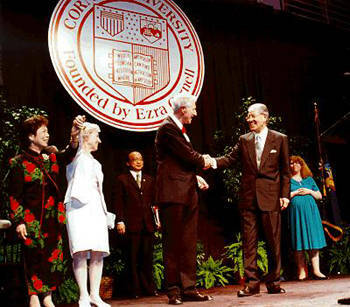 One of the more notable cases was when Congress allowed a visit from Taiwanese President Lee Teng-hui to Cornell University, despite the PRC’s opposition to such high-level visits. Lee Teng-hui’s somewhat provocative speech on June 9, 1995 further strained U.S.-China relations. 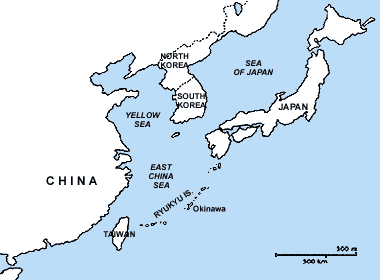 In what would later be known as the Third Taiwan Strait Crisis, the PRC launched a series of missiles in shipping lanes near Taiwan, provoking a similar tense but restrained military response by the U.S.
Howard Lange was the Taiwan Coordination Advisor at the American Institute of Taiwan (AIT), the de facto U.S. mission to Taiwan, during the time of the Crisis. In his June 2000 interviews with Charles Stuart Kennedy, Lange discusses U.S. policy toward Taiwan, the circumstances and consequences of Lee Teng-hui’s visit, and the difficulties the U.S. has had in balancing stable relations with both the P.R.C. and Taiwan. Go here for more on the First and Second Taiwan Strait Crises. Read about the U.S. “de-recognition” of Taiwan as well as Nixon’s historic trip to China. LANGE: In 1979, in connection with shifting our official recognition from Taipei to Beijing, we worked out this seemingly simple but in practice rather elaborate and tortured arrangement that implements an unofficial relationship with Taiwan. What that means in practice is constantly subject to redefinition because there aren’t really any models for this. The interpretation of what it means, among both politicians and policymakers, ranges over a fairly wide field. Since the early 1990s, [Taiwan] has pursued a seat at the UN, using the 28 or 30 countries with which it has official relations. It doesn’t have a chance, and the effort has heightened Beijing’s sensitivity and its resolve to fight tooth and nail any notion that Taiwan was going to get a seat in an international or UN affiliated organization. We explored observer status in the WHO [World Health Organization], for which there was precedent for non-state participation, e.g., the PLO [Palestine Liberation Organization]. Beijing was uncompromising. So we spun our wheels but found nothing, even among obscure and highly specialized organizations. Members of Congress, not surprisingly, thought we were not really trying; that we could work our will if we really wanted to…. The foreign affairs establishment in Taiwan agreed in principle that declaring an independent Taiwan was not in Taiwan’s interest. The issue is that an increasing percentage of the population in Taiwan probably thinks that it should be independent. Taiwan is very prosperous and is now embarked in a new political direction. It doesn’t trust Beijing. There are any number of reasons why an independent course appears to be the way to go. What they’re apparently recognizing is that although independence may be an ultimate goal, to pursue that now is going to be counterproductive. Actually, the status quo works well for Taiwan. It has in many respects the best of all worlds. It has security, including an arrangement with the United States that helps secure the peace in that area. It is prosperous and is a successful trading economy. What it lacks is international status – “respect”. It doesn’t have a seat in the UN, and it doesn’t have a seat in various international bodies. So what most Taiwan people want is status quo plus. They don’t want to change their security, but they want more than that. And why wouldn’t they? Under the U.S. security umbrella, pushing the envelope doesn’t carry a high risk. Going back to 1972, when the Shanghai Communiqué expressed our intention to “normalize” relations with Beijing, and 1979, when we shifted our recognition from Taipei to Beijing – these policy decisions were rooted in a strategic assessment that we needed an official relationship with the “new” China rather than with the China that had lost the civil war in 1949. A relationship with the PRC [People’s Republic of China] was useful to us as a counterbalance to the Soviet Union. Then in 1989, we had Tiananmen and in the same year, the fall of the Berlin Wall, and shortly thereafter, the collapse of the Soviet Union. So changes in our strategic calculations and in our emotional attitudes coincided. We didn’t need Beijing quite as much as we had before. The other thing that happened was that out of necessity, the government in Taipei, and more importantly the KMT [Kuomintang, the ruling political party in Taiwan/Republic of China], began a genuine process of democratization. 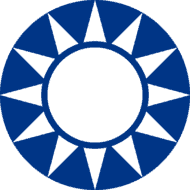 After WWII, the KMT was a party that had dumped itself in Taiwan after losing the civil war on the Mainland, was a minority party, and was seen as an alien imposition on the Taiwan population. But over a period of years it very gradually became “Taiwanized,” and democratization of the political process became really a matter of survival for the KMT. I don’t think it grows primarily out of an ideological attachment to Jeffersonian principles, though a lot of policymakers had received educations in the United States or in the West and were certainly familiar with Western notions of democracy. It couldn’t have happened in the absence of a pragmatic decision that the KMT had to broaden its appeal and had to democratize in order to maintain power and avoid an explosion. So increasingly Taiwan’s system began to look attractive to us. On the other side of the strait, the PRC government not only did not embrace our value system, it explicitly rejected it. Since much of our own national identity is bound up in values that we promote around the world, rejection of those values are difficult for us to tolerate, and that can be a heavy burden for a relationship to bear. So after Tiananmen, there was a clear shift in public, Congressional and media sentiment away from Beijing and toward Taiwan. This contributed to pressure to ratchet up the official nature of our relationship with Taiwan as much as possible and to reject pressure from Beijing not to do so. This led to a couple of things…. One example was the change in the name of the Taiwan office here, from the awkward and somewhat mystifying “Coordinating Council for North American Affairs.” There was clearly a case for changing the name, and Taiwan would have liked to change it in a way that would make it look as official as possible. Many on the Hill also wanted to make it as official as possible. We wanted to change it in a way that clearly identified the office as representative of Taiwan, but at the same time did not identify it as an official organization. We eventually settled on “Taipei Economic and Cultural Representative Office (TECRO).” It’s still pretty awkward, but at least it provides some clue of what the office is about. Taiwan never felt that the State Department was especially sympathetic to their case, and there’s some justification there. The State Department is interested in a rational, logical and consistent policy that clearly serves our interest. I don’t want to say that the Hill is not interested in that; Congressional postures are generally placed in a national interest framework. But Hill people have other priorities and respond to different things, such as constituent pressure and what plays well in the media. The new dimension that Taiwan, specifically the KMT, developed was working directly through lobbyists, in effect bypassing its own foreign affairs establishment. Its Foreign Affairs Ministry had traditionally been dominated by Mainlanders, and they had a clear understanding of this elaborate system that had been worked out, of the official-unofficial balance and what the traffic would bear in Beijing. They wanted to preserve a setup that fostered stability, which is really in Taiwan’s interest. But the first Taiwan-born president, Lee Teng-hui, was much less concerned with any progress toward reunification, or even preserving the status quo, than he was with establishing a separate identity and maximum autonomy for Taiwan. So, against the advice of his foreign affairs establishment, the KMT, through a chum and fellow Cornell grad, Liu Tai-ying, concluded a highly lucrative contract with a lobbying firm in Washington [Cassidy and Associates]. The KMT had vast business interests, and we reckoned at the time that it was probably the wealthiest political party in the world. We understood that Cassidy’s mission was to secure an invitation from Cornell to Lee to address a graduating class, and to get the U.S. Government to permit it…. Lee is an alumnus of Cornell with a graduate degree in agricultural economics. Cornell was actually ready to issue the invitation at any time, and Cassidy’s most important task was to make it happen, knowing that our foreign affairs establishment would see it as an unbalancing act that did not serve our national interests, knowing that it would be interpreted as threatening in Beijing, even as a step toward reestablishment of an official relationship. Cassidy went about this by emphasizing a couple of aspects. One was that this was unofficial. Here’s a man, they said, who’s an alumnus. Cornell can invite any alumnus to make an address. It was a private matter and had no political significance. All of this was hogwash. Chinese on both sides of the Strait knew that the matter was heavy with political significance. We cautioned Members of Congress, both in testimony and privately, that it was a highly charged political matter, though some later professed astonishment at the ensuing firestorm and claimed that State had not warned them. The second pitch by Cassidy was that nobody was going to tell the U.S. to whom we could issue a visa. Were we going to let the Red Chinese tell us we could not? So what if Beijing was a bit unhappy? This argument of course resonates in the U.S. body politic. Cassidy encouraged friendly people in Congress to introduce resolutions in both houses in favor of issuing a visa to Lee to go to Cornell. The resolutions passed overwhelmingly – unanimously in the House and with just one dissenting vote in the Senate. So the Administration faced this dilemma knowing this was going to exact a cost in our relationship with Beijing and knowing that there was no clear benefit to our foreign relations to issue this visa, yet facing an overwhelming expression of Congressional sentiment. I was not a party to any high-level meetings at which decisions were taken but at one point, there was a meeting in then Under Secretary [Peter] Tarnoff’s office with Winston Lord [Assistant Secretary of State for East Asian and Pacific Affairs from 1993 to 1997]. When we briefed Tarnoff on the state of play, particularly on the Hill, he said, “Well, it looks like the game is over. It looks like we’ll have to agree to this visit.” So we did. I presume that Tarnoff had already been in touch with the NSC [National Security Council], and I believe that by the time of the meeting, President [Bill] Clinton had told Virginia Senator Chuck Robb that we would approve the visit, so there was really nothing left for the State Department to fight about. I think the question that was not clearly joined, especially on the Hill, is whether or not it was in our interest to agree to the visit. If we had made a strong case to Cornell not to issue the invitation, they would not have done so, even though they clearly had a right to do so. The Administration could have decided to demonstrate to Beijing that our heart was in the right place by not issuing the visa and forcing Congress, if it had the will, to pass binding legislation rather than a non-binding resolution. But there was never serious consideration of taking such a course, which would have been high risk and a political loser. The way in which this unfolded, with the Administration hanging on to established policy until the last minute, then suddenly capitulating, left us in an unfavorable position with respect to what Lee would actually do when he went to Cornell. There was no negotiating process leading up to the visa decision on what he would say. After the decision was conveyed to Taiwan, we didn’t dare engage in such a process because we knew that any effort would get immediately back to the Hill. We didn’t want to be charged with trying to “muzzle” Lee. Winston Lord has since said, both privately and publicly, that we had an understanding that Lee was going to make a nonpolitical speech – a reflection on his years at Cornell. I think that was just wishful thinking on our part. We never had such an understanding with the Taiwan authorities. Our director in Taipei reported speculation that that’s the sort of speech Lee might give, but I don’t recall that it was speculation rooted in information from Lee’s office. I think it’s not correct to suggest that Taipei betrayed us, though Winston Lord has taken a different position, and he blamed Taiwan’s Washington representative, Benjamin Lu, for not keeping us informed about the speech. The fact is, we had no leverage on speech content, and Benjamin Lu was outside of Taiwan’s decision-making loop, considering that the KMT had frozen out Taiwan’s Foreign Ministry in generating pressure for the Cornell event. In any case, I believe that once we decided to issue the visa, that decision became the essential fact. What Lee said was in a sense secondary, and given all the KMT effort and expense that had gone into producing the invitation and the visa approval, it was fairly predictable that the address was not going to be bland and inoffensive to Beijing. It was not in the event an apolitical speech, and it caused a predictable firestorm. The whole episode surprised Beijing, and it raised questions in the PRC about where we were going with Taiwan policy. As I suggested earlier, the content of the speech was in my view secondary to the mere fact that he was making it: The first president of Taiwan, with which we have unofficial relations, visiting the U.S. for a high-profile event and using that stage to say anything at all on Taiwan’s status was going to alarm Beijing. The speech itself wasn’t blatantly political, but to those fluent in the code of cross-Strait relations, it was provocative. On both sides of the Taiwan Strait, they pay absolutely excruciating attention to terminology. For example, when Lee referred to the “Republic of China on Taiwan”, that conveyed a certain message to Beijing. The previous formulations had always been “Republic of China,” period. The historical background is so important here. When Chiang Kai-shek lost the civil war and retreated to Taiwan, he always said that he would retake the mainland, reinstall the rightful government of China, and restore the Republic of China. We went along with this fantasy for 30 years, some even maintaining that we should “unleash Chiang”. After Chiang Kai-shek died, his son, Chiang Chingkuo, became president. Toward the end of his tenure, Chiang the son explicitly dropped the notion that they would re-invade the mainland at some point and reestablish a Republic of China government. But he did not declare a second China located on Taiwan, or an independent Taiwan. Both sides still subscribed to one-China policy; that is, that Taiwan is a part of China. Whether the Taiwan side under Lee Teng-hui still adhered to a one-China policy was in doubt, and when Lee alluded to the “Republic of China on Taiwan,” it sounded tantamount to a declaration of a second China. But this was not earth-shaking, and what he said was by and large consistent with what he had said on previous occasions, not that Beijing liked hearing them then, either. What was new was that he gained an important political platform. He could have come to Cornell a few years later, when he would no longer be President of Taiwan. But of course he and Cassidy, and for that matter Cornell, weren’t interested in that; they wanted to do it while he was president…. The political fallout from the Cornell episode was predictable in some respects and unpredictable in others. We knew that it was going to cause complications in our relations with China and with Taiwan. There was a Taiwan domestic politics angle. 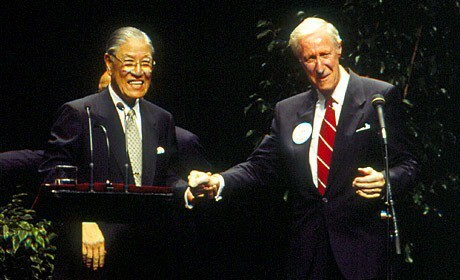 Lee was at this point president by virtue of an indirect election, but Taiwan’s first direct election for president was approaching in March 1996. This could well have been a driving force behind the Cassidy campaign: A U.S. visit would surely lift Lee’s electoral prospects. In advance of elections held earlier for Taiwan’s legislature, Beijing had conducted military exercises, just to remind Taipei that they were there and that military action was possible if political events got out of hand. Military experts agree that there’s no way that Beijing could prevail in a direct military action at this point. The PRC doesn’t have the capacity, including especially the amphibious capability, to mount an invasion. But there are other options. They very explicitly reminded Taipei during this period that they could create problems by disrupting shipping, for example. Taiwan is heavily dependent on foreign trade, so disruption of shipping would exact a very significant economic cost from Taiwan. Beijing did this not very subtly by lobbing a few missiles into waters northeast and southwest of Taiwan, near shipping lanes leading to the ports of Keelung in the north and Kaohsiung in the south. It was a crude demonstration that Beijing could put missiles wherever it chose, either threatening shipping or threatening Taiwan itself. So this caused great consternation, particularly on the Hill, though there was no indication that the PRC planned to take the demonstration further, much less threaten an invasion of Taiwan. Clearly, Beijing was trying to intimidate the voters in Taiwan and convince them not to vote for Lee, this president who had flirted with notions of independence, upset the delicate political balance, and endangered Taiwan security. It didn’t work. Lee won the election by a very substantial margin, and there is a possibility that PRC actions may well have helped Lee. So what was the proper U.S. response to the missile gambit? It’s a difficult question. We had to signal that Taiwan was important to us without saying to Taiwan that we were necessarily and unconditionally going to defend Taiwan if something happened. We’ve always resisted doing that for the very good reason that people in Taiwan might regard this as an invitation to declare independence or do something otherwise provocative. We have never provided a guarantee of military intervention. 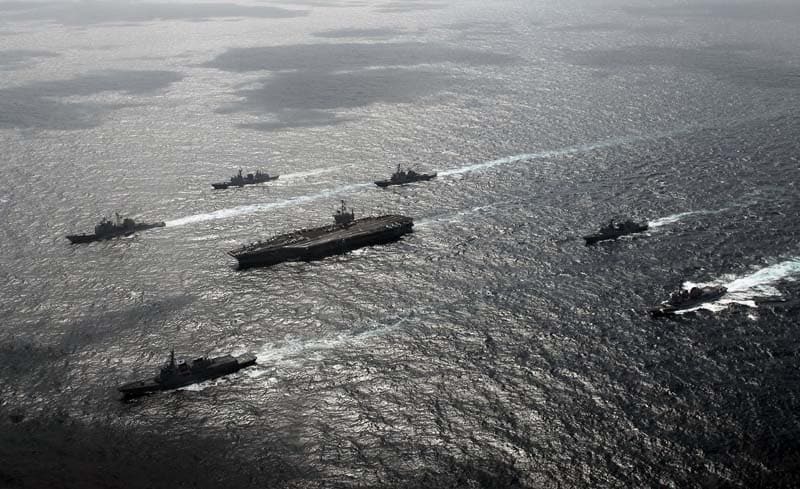 Ultimately, the decision that was taken was to convey to both sides the sense that this was an important issue to the U.S. We did this by dispatching two carrier task forces to the area. Contrary to what is commonly believed and stated, the carriers and their support ships did not go into the Taiwan Strait, but rather stood off Taiwan on the Pacific side. The Taiwan Strait is international waters, and we do with some regularity send naval vessels through the Strait. In this case, we did not do so for the good reason that it would be seen as needlessly provocative. The message of the task force was that this was an area of great policy importance to us. Beijing wasn’t happy with our exercise of gunboat diplomacy, but there wasn’t anything it could do. Beijing had in fact terminated the missile exercise before the carrier task forces were dispatched, so the action was purely symbolic, for the benefit of Beijing, for U.S. public opinion and for Taipei, in descending order. We matched the PRC, symbolic gesture for symbolic gesture, and it was sufficient to allay fears in Congress that we were not responding to the crisis. It was reassuring to Taiwan. Not surprisingly, some in Taiwan also took it as a concrete sign that when the chips are down, the U.S. will defend Taiwan militarily. This is the sort of dangerous belief that we have tried to discourage over the years. The meeting was arranged with extraordinary secrecy, without either AIT/W [American Institute in Taiwan, Washington] or TECRO’s knowledge, mainly to shield it from the ever-resourceful Taiwan press. Berger went over U.S. policy and explained the decision to send the carrier task forces. He gave some emphasis, and he conveyed this in firm tones, to our perception that this cross-Strait confrontation was in significant measure traceable to the Cornell episode, and that it had been in no one’s interest, including Taiwan’s. He indicated pretty clearly that the Administration would not look kindly on another effort by Taiwan to take unilateral action – such as it did on going around the Administration on the Cornell visit – on something that was so closely linked to U.S. interests. It is hard to know how that message was received in Taipei. Ding gave away nothing at the meeting. Whatever he thought personally about the wisdom of the Cornell gambit, he showed not a hint of doubt. One could conclude from the conversation that Taiwan would continue to make its own judgments on its interests. To this I would add my own interpretation: Whether or not it complicates American foreign relations. It is certain that Taipei will continue to place great store in its relations with members of Congress. Since the KMT has been voted out of power, perhaps it no longer maintains the sort of independent relationship with lobbyists that produced Cornell. Its successor as majority party, the Democratic Progressive Party (DPP), even if it wanted to pursue this sort of back channel foreign relations, does not have the resources to do so. The DPP does, however, keep its lines open to Members of Congress. Other groups that openly promote Taiwan independence have long had strong relationships with some Members. In a sense it goes back to your broader question of how we view China. Is it or could it be an adversary? What are its intentions, to the extent that we can determine them? Is it in our interest to promote the international status of Taiwan in the course of one of these transits, even if it complicates our relations with the PRC? From our standpoint, it could be viewed as the “right thing” to do, consistent with spreading our values beyond our borders. 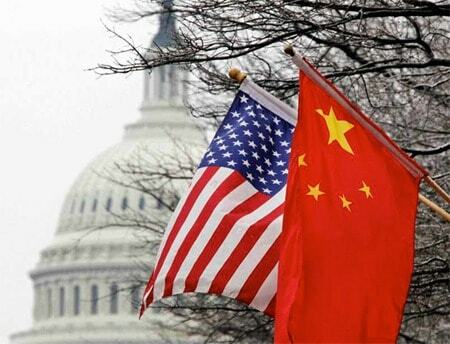 Beijing however is likely to view it as a threatening interference in a Chinese affair. It is useful to recall the self-fulfilling prophecy to which Winston Lord often referred: If we want China as an enemy, we can assure that by treating them as such. The fact is that Beijing explicitly rejects many of our notions about governance, for example, or human rights. As a nation, we have a relatively short history, and we are the product of many different social and historical traditions. One thing that ties us together is shared values, and we actively promote those values abroad, much more than other countries do. We are comfortable when others accept those values. Taiwan has bought into this vision, but the PRC has not. Another problem is that large countries have large interests, usually think they’re right, and don’t like to be told what to do. That’s true of China – literally, the “Middle Kingdom” – and of the U.S. Here’s an illustration of how our differing perceptions of the PRC and Taiwan can come into play in a concrete way. Taiwan has official relations with some smaller countries in Central America and Africa, often those where Taiwan’s aid programs can influence diplomatic recognition. From time to time, Taiwan’s political leaders, including the president, want to visit those countries. The only convenient way to get to those in Central America is through the United States, so we’ve worked out these carefully delimited arrangements for transit. This is strongly opposed by Beijing, which would prefer to keep tightening the noose and completely isolate Taiwan. We’ve told Beijing that we are nevertheless going to permit transits, for the “comfort and convenience” of the traveler. These transits are not meant to be political events, but not surprisingly, Taiwan usually tries to push the envelope and gain some political mileage of one sort or the other. One of these episodes provided the backdrop for the Cornell visa decision. In 1993, Lee Teng-hui wanted to visit Central America. He wanted to stop in Hawaii and while there touch base with Chinese-American groups. We tried to negotiate an arrangement whereby he could refuel the plane, but rather than contact overseas Chinese, take a rest in the VIP lounge at Hickam AFB [in Honolulu]. This was consistent with policy but did not meet Lee’s expectations. He was so teed off that upon landing, he refused to deplane. It was a master stroke, aided by the press which widely reported that he was not allowed to deplane. Friends of Taiwan were outraged, and were determined that we would never again show such “disrespect” to the President of Taiwan, or “kowtow” to Beijing. The rest, as they say, is history.